[February 23, 2009] SEOUL, South Korea (AP) -- North Korea recently deployed a new type of medium-range ballistic missile capable of reaching northern Australia and the U.S. territory of Guam, South Korea's Defense Ministry said Monday. The report comes amid speculation that the isolated regime also is preparing to test-fire another, longer-range missile capable of hitting Alaska. The new medium-range ballistic missile can travel at least 1,800 miles (3,000 kilometers), which would put the Pacific island of Guam, the northern tip of Australia and much of Russia and India within striking distance, the ministry said in a defense assessment of North Korea issued every two years. 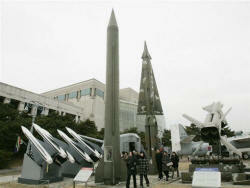 The new missile is believed to be the same type displayed at a military parade in North Korea in 2007. The communist nation has been developing the missile since the late 1990s, the report said. North Korea is also believed to be preparing to test-fire a version of its longest-range ballistic missile, the Taepodong-2, amid heightened tension with Seoul. North Korea's state media have been churning out near-daily criticism of Lee, calling him a "traitor" and "human scum." On Monday, the North's main Rodong Sinmun newspaper accused Lee of driving the Koreas "to the brink of a war." Media reports say the missile being readied for launch could be an advanced version of the Taepodong-2 that could reach even farther than Alaska to the U.S. west coast. North Korea's missile program is a major security concern for the region, along with its nuclear weapons development. That test alarmed the world and gave new energy to the stop-and-go diplomacy over North Korea's nuclear program, though the North is not yet believed to have mastered the miniaturization technology required to put a nuclear warhead on a missile. South Korea would be the most likely target of the Scuds, which have a range of up to 310 miles (500 kilometers), while Japan would be the likely focus for Nodongs. The North is believed to have more than 1,000 Nodong and Scud missiles in its arsenal. The defense report called North Korea a "direct and serious threat" and noted an increase in its troops. About 180,000 of the North's 1.19 million troops are special warfare forces trained for nighttime, mountain and street fighting -- up from 120,000 reported two years ago, it said. The move shows the North is prepared for various types of attacks on the South in case of war, the report said. It also said North Korea has been beefing up its navy, bolstering submarines and developing new ground-to-ship and ship-to-ship missiles and torpedoes amid concerns it may provoke an armed clash in waters near its disputed sea border with South Korea. The report said North Korea is believed to have secured about 88 pounds (40 kilograms) of plutonium -- thought to be enough to make six or seven nuclear bombs -- and conducted an atomic test in 2006. Former U.S. Defense Secretary William Perry told a forum in Seoul on Monday that he supported a dialogue to reduce tension on the Korean peninsula but was opposed to giving in to the North's saber rattling. "I believe that we should continue to talk, but under no conditions should we show any signs of weakness under North Korean provocations," said Perry, who headed the Pentagon during a 1994 nuclear standoff with North Korea.